March was a lackluster reading month. I read one excellent book -- so good that I want to buy a copy and underline everything -- followed by a series of just okay books. I went for a mix of nonfiction, new publications, and old classics, but unfortunately I seem to have hit upon a losing combination. I wrote a full review of this brilliant read here, but to summarise: Notes on a Foreign Country is written by Suzy Hansen, an American journalist living in Turkey, and explores her evolving perception of the United States, what it means to be an American, and how American history has impacted foreign nations. I found Hansen's notes on American influence in the Middle East and Americans' ignorance of their own country's reputation refreshing blunt and honest, and in line with many of the things I've discovered and heard from others over the years. Hansen interweaves her own experiences and travels with historical articles and books and musings from historical and modern day writers to create a book that challenges Americans to dig deeper into their own country's history and influence on the rest of the world. An absolute must read. While I enjoyed reading this one, I didn't find it to be the consuming puzzle that so many other reviewers seem to have taken it as. Asymmetry is two novellas with a short coda at the end: the first, the telling of a relationship between an older, famous author (Ezra) and a young aspiring writer (Alice), and the second, the tale of an Iraqi-American detained at Heathrow Airport. SPOILER: I took the second story to be the book Alice writes after Ezra, which explains why the stories are so different and seemingly unconnected. 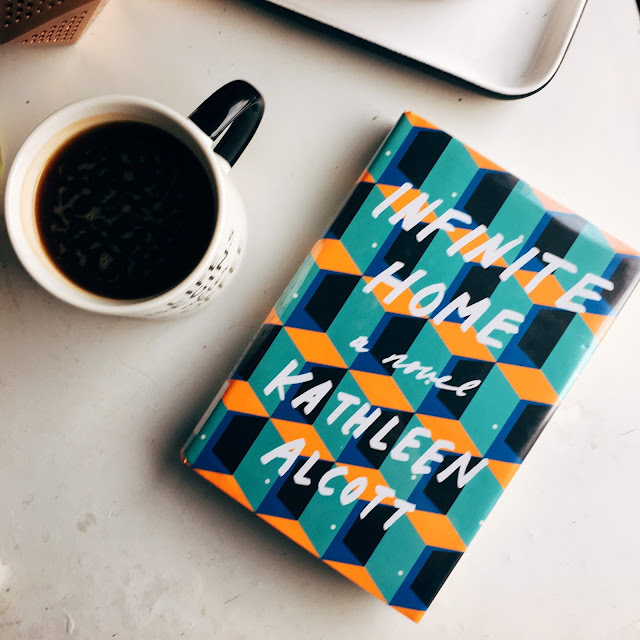 The touching tale of a self-made family, Infinite Home follows a cast of characters as they attempt to save the Brooklyn brownstone they all reside in from their landlord's son. Alcott seems to rely a little too heavily on the "quirky but lovable" trope, as every character is full of unique, spelled-out-in-detail mannerisms and flaws that come across as Alcott trying too hard rather than her genuinely crafting people. Because of this, the emotional impact of the story is contrived and falls short of its potential. After falling in love with Shamsie's Home Fire, I wanted to read more of her work; however, A God in Every Stone did not live up to my expectations. Though the book's description sounded like it was the intertwining storylines of two people -- Vivian Rose Spencer, an aspiring archaeologist, and Qayyum Gul, an Indian soldier returning from war -- the book felt more like a mish-mash of stories and events with the two characters (and many other minor characters) thrown in. None of the characters were particularly well constructed, a shame considering how brilliant the portrayal of the characters' emotions in Home Fire are. Additionally, the book's page length falls short of the epic it promises; the story has the ambition of a 700 page novel squeezed into a 325 page novel. This short story collection held a lot of promise as O'Connor's most famous work, but I quickly discovered that O'Connor's storytelling style is not my thing. She accomplishes what she set out to do: create dark, revolting tales of people. And while I don't usually mind stories that dig into the darker side of human nature, I did not enjoy these depictions. Usually when authors portray humanity's misdeeds it's through a filter of morals, but O'Connor seems to have written these tales for the sole reason of showing how much she despises humanity. Her utter disdain for people is present in every word, and it left me with an unsettled feeling. I thought I'd be hooked from the start as the prologue quickly captured my interest, but the subsequent chapters ended the appeal. The book follows Leah, the wife of an eccentric novelist Robert, as she decides to move to Paris with her two daughters after her husband goes missing. While I enjoyed the more minor parts of the story, particularly the two daughters' lives, I had a hard time caring about the book's central relationship between Robert and Leah. Robert was in the story too little for me to really be invested in his disappearance, and Leah seemed to hit all the wrong emotional notes until 75-80% of the way through the book. I enjoyed the last third of the book, but it took far too long for the story to start moving.